For several months now, I’ve been working on a new online project, which will allow people to buy Albanian books online. The website will allow you to order books and then they will be mailed to you from Albania using different shipping options that have been configured on the online bookstore. This is a great way for those who speak Albanian but currently reside elsewhere in the world to get their hands on Albanian books. Anyone who is able to get online, whether it be at an internet café or using o2 Broadband in their home, will be able to benefit from using this service. We aim to keep people up to date on the latest Albanian releases, and offer a useful service for those interested in books. For book lovers who often find it difficult to find text written in Albanian, this is a great opportunity to stay up to date. This is not the only such project on the Internet, however, it is quite unique as it provides you with many more facilities and a usability close to that of Amazon.com where customers can register, get notified for new books, create a wish list and many more things that will be added to the bookstore as the work goes on. So far we have sold the first two books, to a customer living in Britain, but with an U.S. address. And we have not even started to advertise yet. 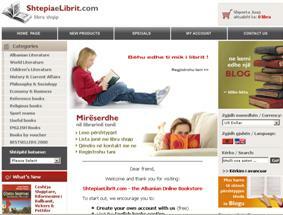 Anyway, if you want to check it out, then visit “ShtepiaeLibrit.com – libra shqip” www.shtepiaelibrit.com For those of you who speak Albanian we are implementing also a Blog (www.shtepiaelibrit.com/blog) to go with the website where you can get updates about what’s going on with the website (new books, project progress, etc). You can also subscribe to the Blog and get updates that way. By the way I would love to get your feedback on this project as it is quite important for me and the other partner in business. We think that we have a pretty good project in hand and that it could go quite well, and your feedback would definitively allows us to achieve our goals. Next articleDid you know that you can subscribe to my Blog by Email ?